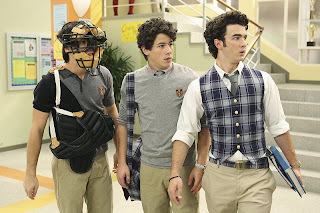 Disney Interactive Studios announced development of JONAS for Nintendo DS. The game allows players to take on the role of three superstar brothers, Nick, Joe and Kevin Lucas, in outrageous adventures from their DC series. Players help the JONAS band members juggle concerts, school, friends and fans to find the balance between their rock star world and ordinary lives. VP of Marketing: 'JONAS is the perfect complement to the hit television show, giving fans additional access to the Jonas Brothers as they portray the Lucas Brothers, their music, their fashion and their lives. of the Jonas Brothers entertained and engaged this holiday season.' The game features other main characters from the show, including good friends Macy and Stella, and lets fans explore familiar locations including the brother's firehouse and school as seen in the television show. Players can also customize the JONAS band members' wardrobe for their daytime antics, as well as cool outfits for when they take the stage. JONAS allows players to collect musical notes to power up their guitars and then..
..strike the right guitar chords to overcome obstacles and help JONAS band members. The game also features hit songs the show. Fans will be able to perform to the songs in concerts after each level is completed. JONAS includes access to DGamer, the online community exclusively for Disney gamers on the Nintendo DS, allowing them to chat with other players and unlock additional items in their game. JONAS will be available this fall for Nintendo DS. Will YOU play it?